Hello everyone! Remember those pretty plum blossoms I posted photos of yesterday? Well, I was loving them so much that I thought I would use them in a few more photos for today. I hope you don’t mind, but I figure that they’ll be gone before I know it and why not use what ya got. Right?! Anyway, I decide to pair them with some nice vintage elements that I have here in my home. In my book, flowers plus vintage is just about pure perfection when it comes to decorating. For your viewing pleasure…a few more little blooms with some vintage letters. To add to the pretty and vintage feel of my photos I layered on one of Kim Klassen’s textures…serendipity. These are all so sweet, lovely shots, lovely processing. 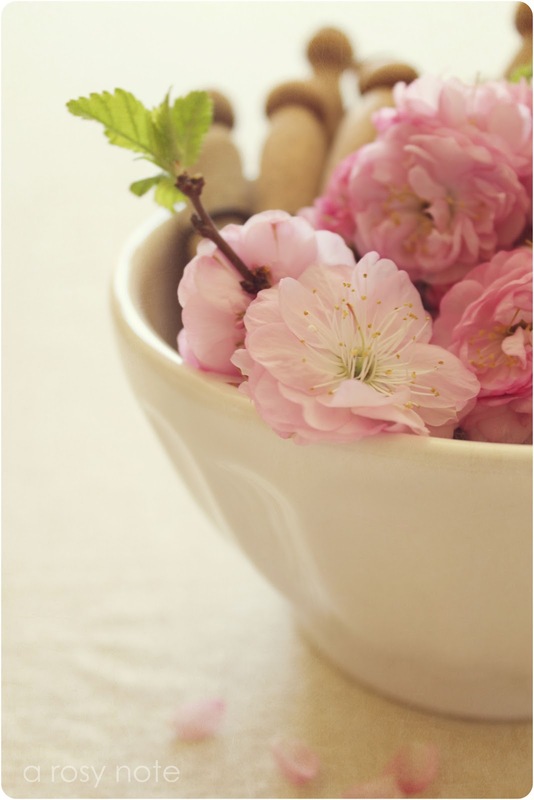 I love that bowl of blossoms. Beautiful. Beautiful photos, Tricia and your new header is lovely. Hope you have a great week. Beautiful! So pretty, pink and vintage! These are so very pretty, I love the colour of the blossom, is it cherry? Love the bowl of clothespins! Pretty in pink, I love the look of your images, nicely done. We're in TOTAL agreement. The inkwell makes an awesome vase. I love it! The shape is just right – in fact, I wouldn't even have guessed that it was an inkwell at all – but knowing that it is just adds to the whole cool factor!!! I love those blossoms too! You did make them pop out in these photos! love them! Just beautiful!! Pretty in pink! I love the way you staged each photo, and the textures are perfect. I love all your photos Tricia! you can use blossoms whenever you like, you capture them beautifully! I love the inkwell as a vase, so pretty!!!!! Beautiful! I love the pink pastel tones. Beautiful take on this weeks' prompt. So pretty! I haven't been around blogland much lately. I have sooooo missed your lovely blogs Tricia!! Glorious photos, colours, and texture work – inspiring! LOVE these…love the colors of the plum blossoms and your artful compositions. And the ink well is too cool! Such great soft textures. The flowers are so pretty. They really make for a great shot! So pretty! I love your setups too! From start to finish these images are beautiful. Great work! Tricia, your header is so beautiful! Very feminine. Love it. The flowers are absolutely amazing. Beautiful – love the vintage look! Great and unique idea for displaying the flowers for the Texture Tuesday. Lovely. I love these! My bush died (too many trees and not enough sun). I grew up with a bush in our yard and I just loved them! After seeing your photos I'm going find one. Thanks for sharing these lovely flowers! You are so good with set up and again I'm looking envy those gorgeous blum blooms, I could watch them forever. What a lovely post, Tricia…your photos are beyond beautiful!! I love your header, too! Thank you for stopping by my "baby" blog. I'm tickled that you loved my pictures of Bermuda. ps I love the new background. It's so soft, lovely and beautiful! Your photos are so pretty and romantic. My favourite spring shrub is a flowering almond. How gorgeous! Great compositions and colours again! Thanks so much for visiting my blog and leaving such nice words yesterday! Your photography is so amazing! You have a great eye and creative flair. Love it! Tricia…everything you do has a wonderful sense of delicacy to it. Beautiful photography! As always your images are supreme! Such a soft, pretty pink that I could NEVER get a enough of! Your photography is breathtaking! Loving the vignette and the Blossoms. Gorgeous! I won't argue on the ink well 🙂 Unconventional flower displays are the best! Each of these is so beautifully composed Tricia! 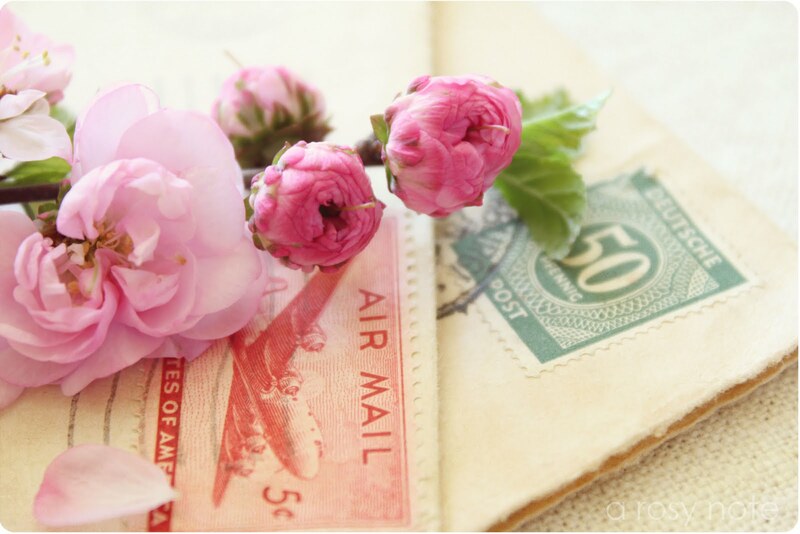 Gorgeous Photography ~ I am officially in LOVE with your Blog..everything is gorgeous! …you really do love those beautiful plum blossoms ~ LOL!! A beautiful addition to Texture Tues. Love the soft pinkness of your creations. Beautiful photo's and compositions! 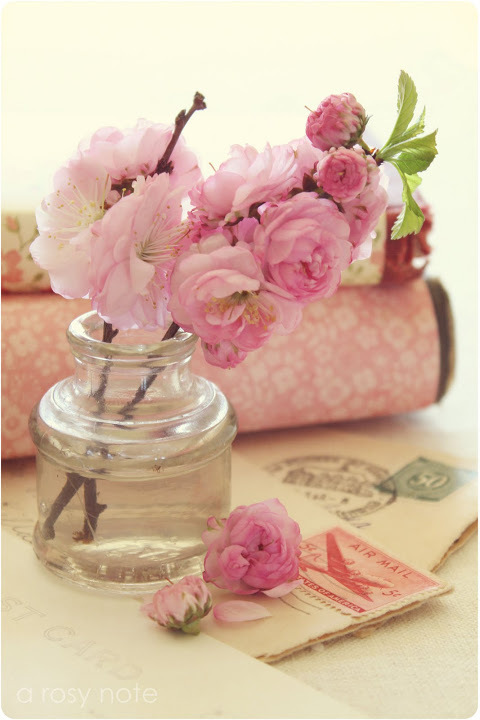 I heART these vintage pleasures!Beautiful blossom and love .. in the Pink! Simply beautiful! I'm so glad you decided to bring a few in the house. Your displays are so pretty and cheerful. I always enjoy your photography so very much and I look forward to future posts. beautiful – I love the airmail accents! Absolutely beautiful. I love them all! Absolutely gorgeous! I love all of the pink! These photos are so soft and so feminine. What a beautiful post.I enjoyed my visit to your lovely blog. I'm following you now. Hugs! Just popped in after a long time out of blogland and was blown away by your pink flowers. Wonderful! Pretty! Very beautiful. It is fantastic that plum tree flowers in a cafe au lait bowi. Oh, goodness! They are so dreamy and lovely…fabulous. I am with you…. when something is this lovely it deserves an extra day or two:-) Your photos are captivating! You always inspire me so much with your beautiful photos! Gorgeous! I am loving your new header too! Your photos are simply dreamy!!! Tricia, I love the delicate look of your floral photos. So pretty and innocent. thank you Tricia! i love your photos, they´re so feminine! and the light is stunning! o love shooting flowers too, soft colors, natural light everything we need for a beautiful photo, don´t you think ? your photography is so amazing! it always makes me smile to come visit you! so inspiring!